A female sergeant has reportedly opened a case of assault against the EFF commander-in-chief. EFF leader Julius Malema stands accused of assaulting a female parliamentary protection and security services officer after last week’s state of the nation address (Sona), EWN has reported. This was part of the same incident which saw EFF MP Marshall Dlamini slap a plain-clothes police officer after Sona on Thursday night. The officer, Warrant Officer Johan Carstens, has since opened an assault case. The police’s official incident report on the matter contains allegations that Malema “roughly” pushed a female officer, believed to be a sergeant, by her neck. This part of the incident is not visible in the video of the altercation, which went viral. The sergeant has reportedly also opened an assault case. 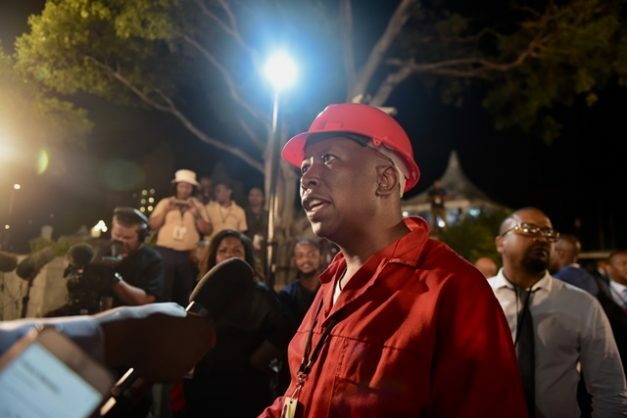 The EFF has claimed that the incident was an act of “necessary self-defence” as they had received information about a possible assassination attempt on their leader, Julius Malema. Parliament said in a statement on Friday that its presiding officers condemned the incident. The statement from parliament said: “An initial report alleges that Warrant Officer Johan Carstens, responsible for cordoning off the exit area for the procession, faced sudden confrontation and was attacked by the EFF MP, resulting in facial injuries. The statement went on to describe the conduct of the MP as “shameful”, while at the same time confirming parliament was probing the matter.